Do they know it’s Christmas time at all? …They do now! 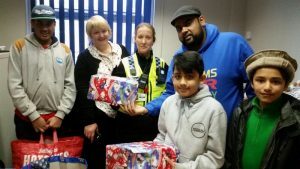 A group of generous Muslims from Huddersfield brought seasonal joy to foster care children this month, after they were moved by an appeal by a local policewoman. The Ahmadiyya Muslim Youth Association (AMYA) were touched by the ‘devastating story’ PC Sally Baines highlighted on her Twitter feed, regarding two young boys who had a difficult upbringing and who never received any toys at Christmas. PC Baines, of West Yorkshire Police, had asked for help on social media on Friday 16th December, saying the two boys had never had basic belongings. She tweeted: “Just been told about 2 kids under 6 who have been taken into Foster Care. Never had pillows, toothbrushes, toys. I am heartbroken. Idris Yousaf, the local co-ordinator for welfare and charities for AMYA, set about organising a visit by children and young people to meet and give gifts to the two youngsters, aged five and six. Idris said: “Being proud British and Yorkshire Muslims, we’re obliged and always keen to help those in need wherever we can, especially children like these two little gems who are facing difficult emotional challenges during this time of the year. The group’s charitable efforts have not ended there, as they have already visited local nursing homes in Sheffield, Rotherham and Huddersfield and plan to visit more on Christmas Eve and Christmas day. On New Year’s day, volunteers are also going to clean Yorkshire’s streets, including Huddersfield, Sheffield, Rotherham, Doncaster and Scunthorpe. Share the post "Do they know it’s Christmas time at all? …They do now!"